An Ayurvedic revitalising blend of plant, seed and essential oils to help rebuild collagen, whilst promoting restful sleep. Designed for night-time use on all skin types apply to assist cellular regeneration with the help of frankincense, camellia and rose maroc oils. 30ml. Buying this product = 66 Reward points for Members. Your cart will total 66 points = voucher of $3.30. Not a Member? Join at checkout to claim these points. 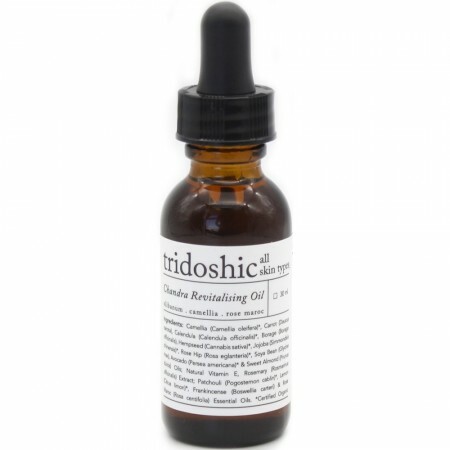 Beneficial for acne prone skin* owing to the inclusion of essential fatty acids. The benefits are two-fold: Firstly, EFAs cause healthy cell transference which helps dissolves the fatty deposits that block pores and cause acne and secondly, they work to repair the skin damaged by pimples and blemishes. Apply 3-4 drops to damp skin, combine with aloe for blemished or inflamed skin; add to nourishing oil & mist for dry skin; apply neat to scars, burns or grazes. Camellia (Camelia oleifera)*, Carrot (Daucus carota), Calendula (Calendula officinalis)*, Borage Borago officinalis), Hempseed Cannabis sativa)*, Jojoba (Simmondsia chinensis)*, Rose Hip (rosa eglanteria)*, Soya Bean (glycine max), Avocado (persea americana)*, & Sweet Almond (Prunus dulcis) Oils; Natural Vitamin E, Rosemary Extract (Rosmarinus officinalis) Extract; Patchouli (pogostemom cablin)*, Lemon (citrus limon)*, Frankincense (Boswelia carteri) & Rose Maroc (Rosa centifolia) Essential Oils. *Certified Organic. 30ml glass bottle with dropper.